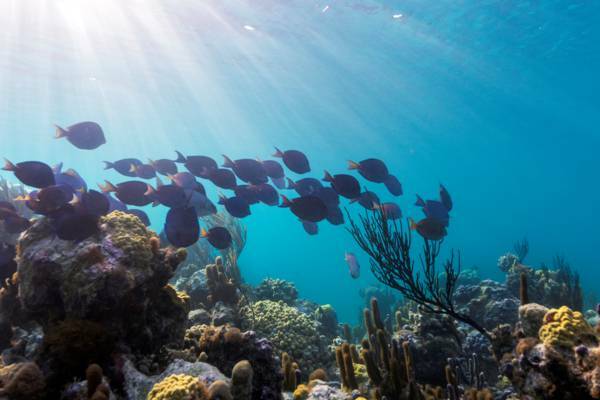 The beautiful reefs of Providenciales. A school of French grunt fish on the reef. Snuba is a fun and interesting way to explore the shallow reefs off Providenciales. This unique water sport combines elements of both snorkelling and scuba diving, yet is easy to participate in and doesn’t require the certification and training that scuba diving does. The typical snuba setup consists of a conventional scuba tank that floats on a small raft on the surface, and a long air line that the diver uses. The diver will usually has fins, a weight belt, and snorkel mask, and can move in any direction underwater with quite a bit of freedom. Each diver is independent of other divers. The primary benefits of snuba over snorkelling is the ability to explore greater depths. There’s typically a tremendous array of tiny and interesting sea creatures to see, many of which are highly proficient in hiding. Simply having the ability to spend time 10-15 feet below the surface at a reef will allow for great and unexpected sightings. In commercial diving circles, the snuba style of diving is often referred to as hookah diving, and is great in shallow situations where a tank can be cumbersome. Snuba is very easy to master, and children as young as eight can participate. Due to the shallow depths of the snuba sites on Providenciales, many of the dangers associated with scuba diving are reduced or avoided. The snuba system works by connecting the diver by air hose to tanks on the surface. One end of the hose is connected to the scuba tank, and the other end has a scuba-style regulator to breathe from. All of the heavy equipment floats on a small raft that follows on the surface, allowing the diver to move about and explore. down to about 20 feet. As with diving, a weight belt is used to control buoyancy, and the weight amount is tweaked according to the diver. A significant advantage that snuba has over conventional scuba diving is ease of learning: it takes coursework and several days of instruction to become a PADI certified Open Water Diver, versus a half hour lesson in the case of snuba. This activity is also a great precursor and trial activity for potential scuba divers, as you’ll get to experience many concepts and practices common to both sports. Snuba is regularly offered at the beach near the Bight Reef in central Providenciales. The Bight Reef is a beautiful and easily accessible reef system that’s perfect for beginning snorkelers. There’s typically a fascinating and varied selection of sea life to discover, from an impressive collection of colourful reef fish, to lobsters, stingrays, hawksbill turtles, and the occasional nurse shark. Snuba Turks and Caicos, the primary snuba company on the island, also has a dive boat for off shore adventures. The boat charters combine both snorkelling and snuba, and operate several days per week. The offshore barrier reef of the Princess Alexandra National Park that protects Grace Bay Beach offers a contrasting atmosphere to the beach reefs, with more complex reef structure, clearer blue water, yellow and purple sea fans that sway with the ocean swell, and the chance to spot larger creatures such as Caribbean reef sharks. Due to the limited availability, we advise scheduling in advance of your preferred diving time to ensure your group can be accommodated.